Is a high or low temperature a problem? How is a high or low temperature treated? Body temperature is a measure of how much heat the body makes. 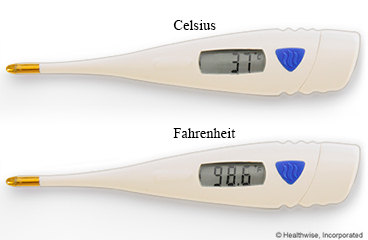 A normal body temperature is 37°C. The body usually keeps its temperature within a safe range. But a newborn's body may not be able to do this for several days to weeks. This is more common with premature babies. Often, a high or low temperature is not a problem. It may mean that your baby is getting used to life outside the womb. But sometimes it can be a sign of a problem. Your baby may have an infection. A newborn may have a fever if the mother had a fever before she gave birth. The baby may be wearing too many clothes. Or he or she may have too many blankets. Check to see if your baby has an infection. Check your baby's weight. This is to find out if your baby is getting enough to eat. Take steps to treat your baby's temperature. For a low temperature, your doctor may use an incubator or plastic hoods or blankets. Or he or she may ask a caregiver to hold the baby skin-to-skin. This is called kangaroo care. For a high temperature, your doctor may tell you to take the covers off your baby. Or your doctor may give your baby acetaminophen (Tylenol). Enter H383 in the search box to learn more about "Learning About Body Temperature Problems in Newborns".